Happy Friday! It’s time for the weekend and probably a few drinks or cocktails…don’t you think? 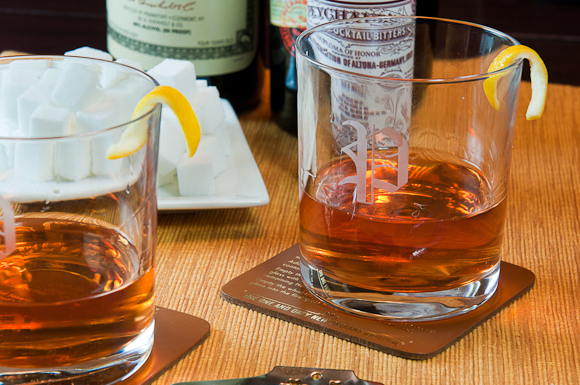 What better drink to usher in your weekend than a Sazerac? After all, it is the official drink of the city of New Orleans and Mardi Gras and Fat Tuesday is next week! We are having some kind of fun in New Orleans (maybe too much?)! One of our many stops in this food and booze overload culinary journey was to Mr. B’s Bistro in the French Quarter. It was here that I first tried the Sazerac and now I am hooked! They make lots of these cocktails at Mr. B’s Bistro. 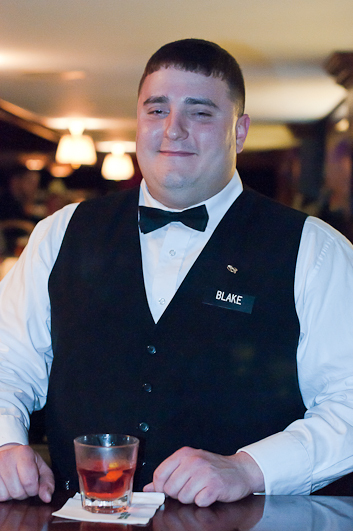 I think Blake has had a few Sazeracs! If you are interested in the history behind this delightful cocktail (as we were), then you must visit the Sazerac Bar at The Roosevelt Hotel in New Orleans and speak with Russ Bergeron, the mixologist/historian in residence. 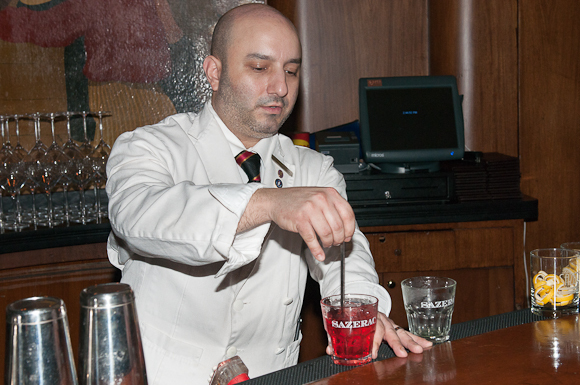 Russ, who helped reopen the Sazerac Bar in 2009 (after Hurricane Katrina and a major renovation to the hotel), says they serve about 40,000 Sazerac cocktails a year. A native New Orleanian, Russ worked as a bartender for twelve years and then was the Wine Director and Sommelier at Emerils’s for ten years. I think he just might know a thing or two about mixing up this rather famous local cocktail. According to Russ, this cocktail’s history traces back to the 1800‘s when Antoine Amedie Peychaud (who owned an apothecary on Royal Street) made Peychaud bitters from an old family recipe. He also enjoyed a fine French Cognac that was available at the time, Sazerac, so he created the Sazerac cocktail with the addition of a sugar cube and Herbsaint (better known as Absinthe). Peychaud, who was quite fond of this drink, then opened the Sazerac Coffee House (euphemism for saloon) on Exchange Alley. You will need a good Rye Whiskey and Peychaud bitters to make this drink. Stir it 30 – 40 times to make it nice and cold. 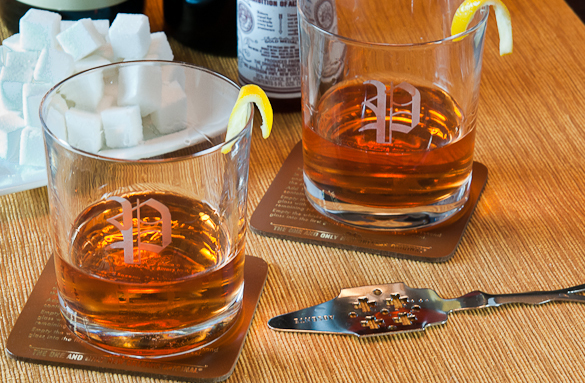 Strain the drink and pour into a chilled glass coated with Herbsaint. Sometime in the 1870’s, a gentleman by the name of Thomas Handy took over the ownership of the saloon and replaced American Rye Whiskey for the French Cognac, which was difficult to find during those times after the phyloxxera epidemic in Europe. 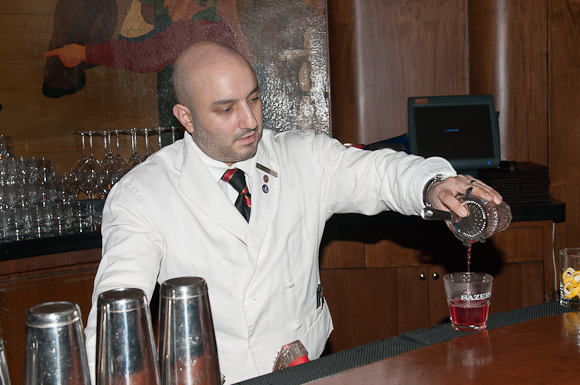 The Sazerac Bar eventually relocated to the The Roosevelt Hotel in 1949 and that is where it remains today. 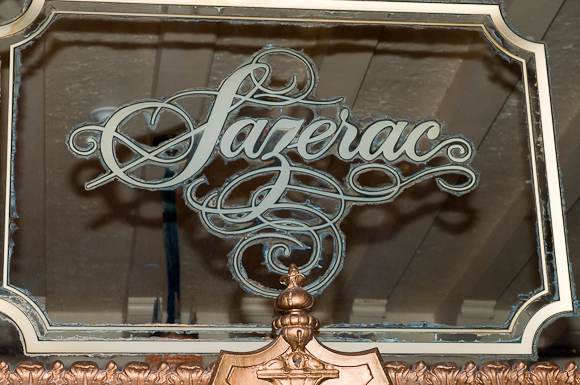 The original Sazerac Bar was in an area where the gift shop is now located and was moved to its current location in 1958. This beautiful, historic bar is 72 years old and contains all of its original hand painted murals and hardwoods. 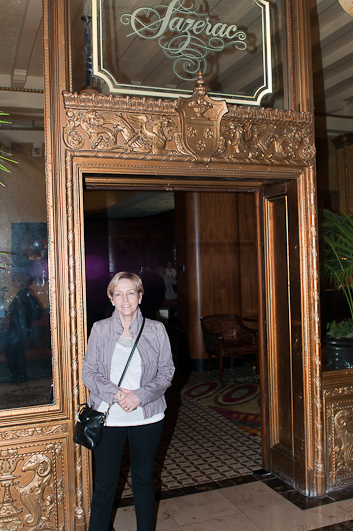 I was smiling when I left the Sazerc Bar! 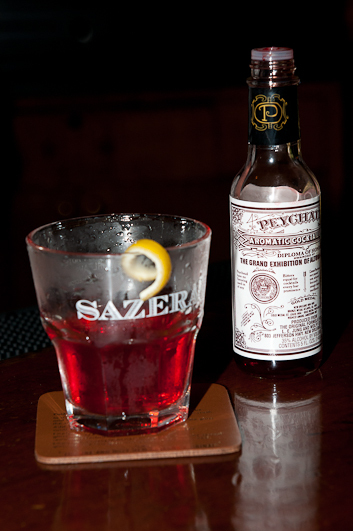 The timeless Sazerac became the official cocktail of the city of New Orleans in 2008. As I mentioned above, it is also the traditional cocktail of the Rex Parade during Mardi Gras. Rex is King of the Carnival. 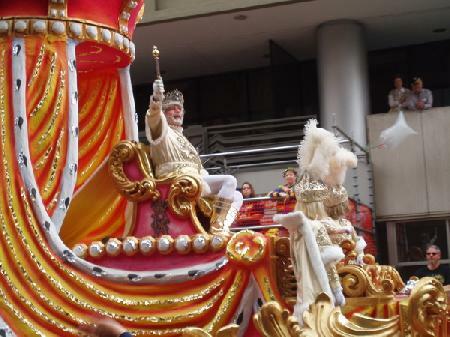 Rex is also the oldest carnival cruise in Mardi Gras. Russ told me that the King of Rex, who is usually a wealthy and prominent New Orleanian, will get dressed for the parade and then have a Sazerac (possibly two?) and then get on the float for the parade on Fat Tuesday. What a way to start your day! He looks like the guy from Burger King! In pursuit of answers to this dilemma, I called Russ! Russ told me that they tend to use a bit more of the bitters and the simple syrup when making them in the bars. They are much redder in color and not as heavy in texture. Russ uses the Sazerac rye whiskey, but Blake (at Mr. B’s) used what we did (Old Overholt), so the difference was not in the whiskey. My Sazeracs looked and tasted very different. I really liked the Sazeracs that I had in New Orleans, but after trying a few from the original recipe last evening, I could be persuaded to go either way! Mr. B prefers the original version which has a heavier texture similar to a Sherry or a Cognac. The drinks in New Orleans were more like a mixed drink. To confuse the situation even more, Russ told me that Galatoires Restuarant makes them with bourbon and serves them over ice. I can appreciate either version of the Sazerac! In a second Old-Fashioned glass place a sugar cube and add 3 dashes of Peychaud’s Bitters to it, then crush the sugar cube. Add the 1 1/2 ounces of Sazerac Rye Whiskey to the Peychaud’s Bitters and sugar. Empty the ice from the first glass and coat the glass with 1/4 ounce of Herbsaint, then discard the remaining Herbsaint. Empty the whiskey/bitters/sugar mixture from the second glass into the first glass and garnish with lemon peel. Be sure to strain the mixture. 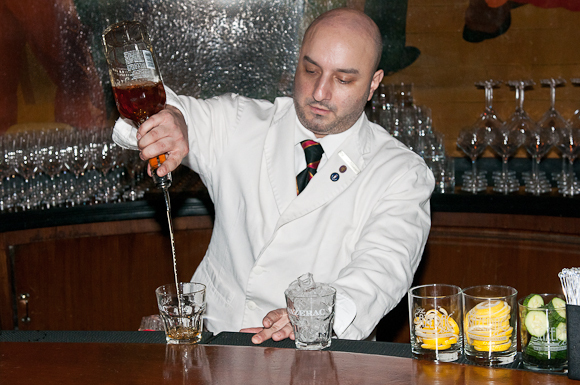 Bartender’s Notes from Russ: You can use any good 6 – 8 year old Rye Whiskey such as Jim Beam, Old Overholt or Rittenhouse. You can also substitute simple syrup (as they do at the Sazerac Bar and other bars) for the sugar cube. I can just tell that this would be my new favorite drink! Your features are such fun, Gwen! Love this one! I think the Sazerac is the way to go for the more sophisticated drinker in New Orleans, and leave those nasty, sweet, Hurricanes to the younger crowd. 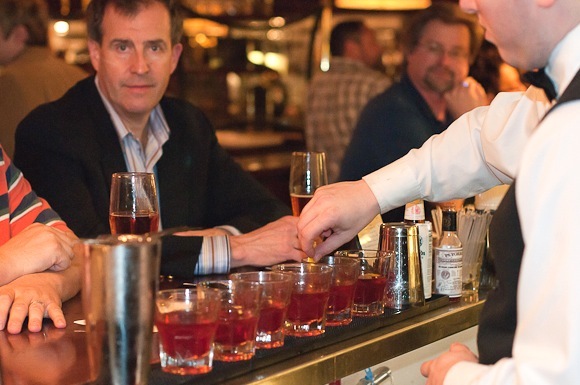 That was a great time at Mr. B’s learning to make a Sazerac, but I only had a little sip of Roger’s. Blake does look like he has a little attitude going on! John’s working on finding some Catdaddy Carolina Moonshine around here – that was our favorite. 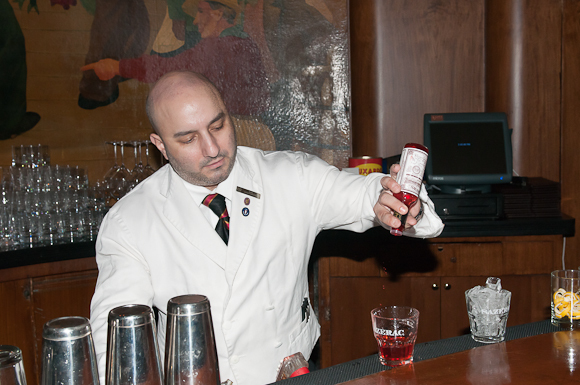 The recipe widely used in the bars of New Orleans uses simple syrup, rather than the sugar cube, and more herb bitters. I found that an interesting drink but when we made the original recipe at home (less bitters and a sugar cube) I really enjoyed it and will add this to our list of cocktails. 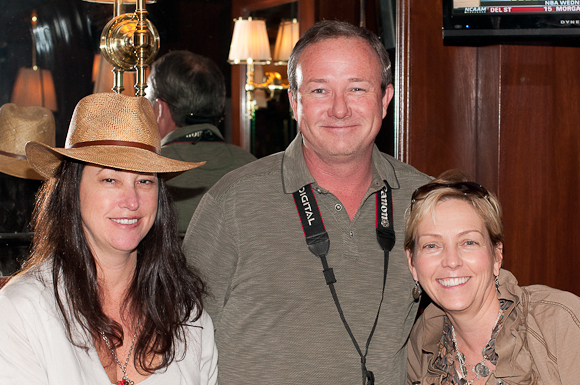 Fun time in New Orleans. I love your travel posts Gwen and looks like you’ve had a wonderful time! I love anything that has a history with this and this drink’s is awesome. I thought that absinthe was an opiate and not available. No? Anyhow, It is so gratifying to read your posts because I devour every word. So much good information, beautiful picture, and fantastic imagery. Many thanks. Ah the pride and joy of New Orleans. You can serve me one any day. Very cool and it looks like you had a great time doing your “research” (wink wink). But this is really the kind of experience anyone should have when visiting a city. And boy I wish I could visit NOLA before my son leaves. Ahhh the sazerac. Great cocktail indeed. Nicely written piece here! This is a drink to measure a bar by in my opinion…it shows technique, character of the barkeep and owns itself to history [a simple whiskey cocktail evolved with a bit of peychauds and absinthe]. Some of the more outstanding examples I have found to date outside of New Orleans; The Gin Joint and FIG in Charleston SC and Bar Agericole in San Francisco [I have been told that Comstock and Bourbon + Branch in San Fran do an equally outstanding job as well!]. The only kicker; when done right, it is amazing, when done wrong, OUCH, disgusting. Thanks for writing about this…in a world of puckers, flavored vodkas, volcano-explosion-cotton-wallbangers it is nice to see a shining star being given rightful recognition! What a great post! 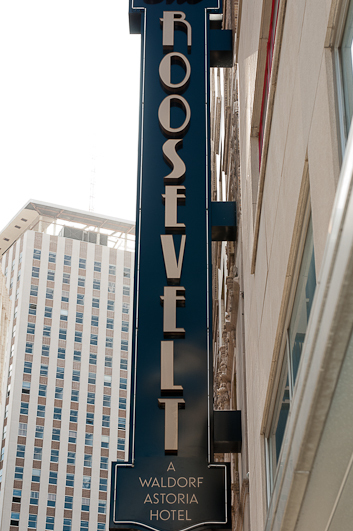 My husband and I recently visited and had quite a few Sazeracs at the Roosevelt. I will let you know that the bartender told me they make their simple syrup with Demerara sugar and not regular sugar. Just a 1:1 ratio, but I think the Demerara is going to give you a better flavor and color. We’re making some this weekend – can’t wait to try it out! 1 La Perruche sugar cube. Put some ice and water in a rocks glass to chill it. Smash with a muddler until dissolved, add the Rye, add ice, and stir. Then dump the excess Pernod. Double strain the whiskey into the coated glass. Twist a lemon peel over the drink then discard. Serve neat.